55 days people! Just 55 days until the first official day of Spring. It’s been raining cats and dogs this winter in California, and although I am grateful our drought situation has much improved, I am missing that sweet glorious sunshine upon my face. Growing up in Australia made me the sun worshipper I am. I have a few examples I have made for you on my Polyvore account. There are so many more including: 80’s glam, 80’s casual, Flashdance (image on oversized top falling off the shoulder), lace and organza layers etc etc. As always take what you want from the trends and make it your own style. So let’s get into it. Here are just some of the trends for Spring/Summer 2017 (hereon known as SS17). Slip Dresses. I have made two sets and details can be found on my Polyvore account. Look 1: Just insert a glorious glass of bubbles. Ive added a sleeveless long black jacket to pull in a trend from last season, and then gold accessory accents to play into that gorgeous blush tone of the slip dress. Lets keep that neckline open and balance things out with some fabulous statement earrings. Look 2: Take me back to the 90’s with this one. Ive created a much more casual day time look, layered with a denim vest, a ”hold everything” cross body bag and uber comfortable Converse chucks (easy — throw them in the wash when they get stinky). 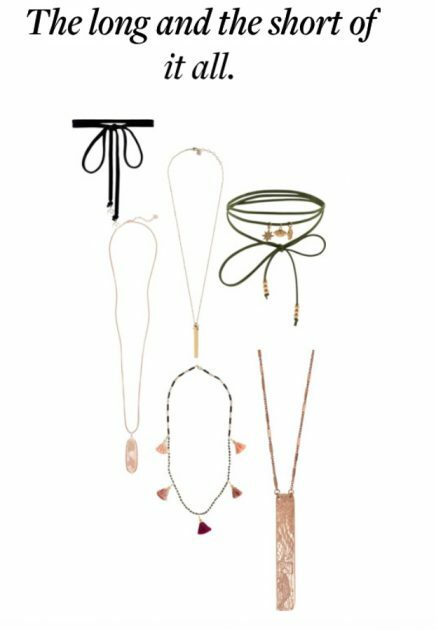 Chokers are around for another season, and are now being joined by long pendants, especially the longest kind. I love the look of layering these babies. Be bold, or go home, I say. Again, details of these items can be found on my Polyvore account. You read that correctly — stripes, of all types! Boating stripes, standard stripes, rugby stripes, candy stripes, beach stripes & banker stripes. Whoever knew there were so many kinds. Top left: wonderful transition piece, the high neck is reminiscent of turtle necks we saw so much of this winter, and the peplum design is so flattering on a few body types. That bell wrist detail is my fav! Top Right: A thicker rugby stripe and ruffle perfect for a rectangular body shape wanting to create some curves and volume. Bottom right: wide legs pants are trending, but let’s balance them out with a fitted tank and a long pendant. Perfection. Bottom Left: Great example of a banker stripe. These shoes are fun and pricey, and I saw them looking simply stunning on the designer at a fashion show I worked recently. Try banker stripes on a simple summer button down, when your next sailing on the harbor. Middle Left: I have been seeing so many more vertical stripes this season. Which stripe is best for your body type? Stay tuned! These guys are here to stay. Jumpsuits have been a good season runner, way longer than I originally thought. But I am so happy about that! I think a great black body suit can flatter so many body types, it’s just finding the correct one. Top Left: Off the shoulder trend here sticking around. I also love the tie waist and added ruffle, perfect for a rectangular shape with great pins. 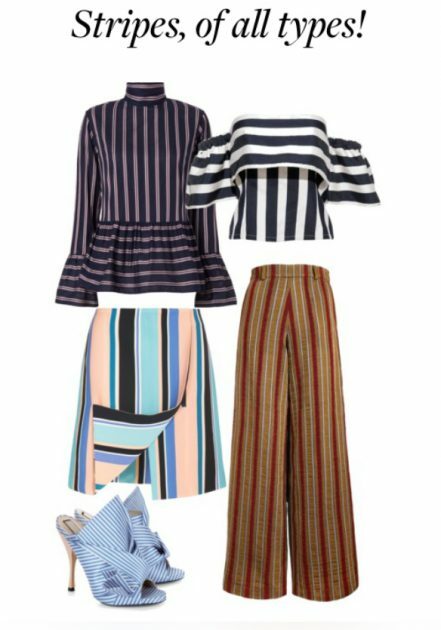 Top Middle: more of those fabulous stripes, with an added trend — the one shoulder top. Top Right: continuing the blush pink trend. Bottom Left: playing with the wide leg trend, and the burgundy trend and high neckline we saw this winter. 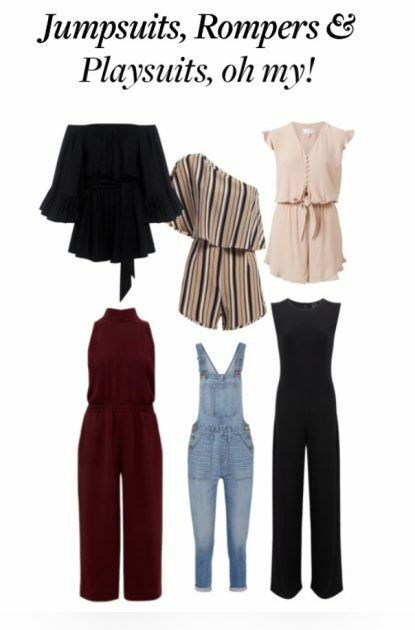 Bottom Middle: Overalls are in the jumpsuit family too. Check out my Instagram account for my overall inspirations. Bottom Right: a classic black jumpsuit. What’s your favorite trend of SS17?